You don't hear a lot of spas going on about the wonders of a good brow tint, mostly because it's a service a lot of spas don't really spend a lot of effort on. It's not all that commonly known like waxing, but oh boy is a tastey morsel of a service at $11. Eliss was introduced to brow tints when she was the wonderful (awkward) age of 13. Being blonde meant she just assumed brows were a face accessory she'll never really have, sure you can colour them in but what fun loving kid is gonna remember not to rub them half way down their face on a long day (usually the day you catch your crush looking at you extra mucho)? Well, after they were tinted those babies showed off their stellar shape and that colour couldn't smudge. Eyebrow and eyelash tinting are a vegetable based rinse that lightly fades with washing, so you won't end up with roots. Tinting only adds colour to hair that it already there, so while it might temporarily tint the skin till an exfoliation, it will not fill in bald spots.If you're a mascara girl for added thickness it's not going to replace mascara, but it can make application easier for lighter lashes that need very full coverage or make you feel more comfortable in situations where you don't want to wear mascara. Tinting is also a beloved service of those who don't like wearing make-up, eyebrow tints can help add focus to the face and like a good brow shape helps create the illusion of lift and well rested eyes (basically it can make you look younger). Eyelash tints help add a subtle outline around your eyes which will help them appear more open. An unexpected benefit of eyelash tints on blonde lashes is it can help block sun since the lashes are now opaque. 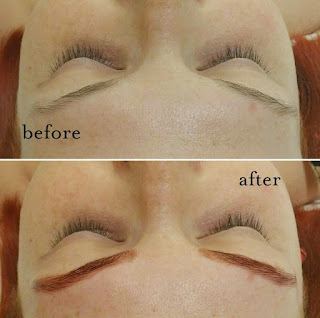 Eyelash tints are a great service for napping, we'll take you into the room and have you lie down. We remove any mascara and apply petrochemical free protective cream (not gross vaseline) and, depending on the eyeshape, gauze to protect your under eye from being stained. We'll have you close your eyes and apply the tint (dark brown, black or blue black [which appears darkest of the three] are the popular choices for eyelash colour). The tint will sit for 5-15 minutes depending on the hairs. We'll then slowly and meticulously remove the tint using water, q-tips and cotton pads. The product does sting if it gets in your eyes but we always have cotton pads to wipe it away. Eyelash tints are usually done every 4-6 weeks. 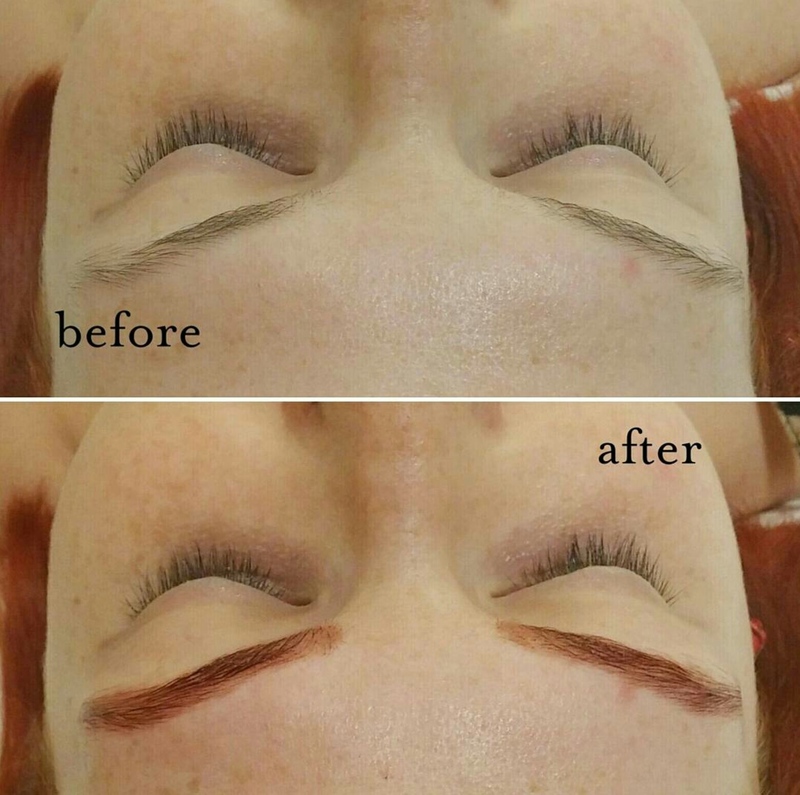 Eyebrow tints are faster, you'll lie down, we may apply the protective barrier cream (it isn't always necessary and each technician has their own technique) and apply the tint in the colour we discuss is best suited for you. Some hairs take the tint less easily, especially greys. 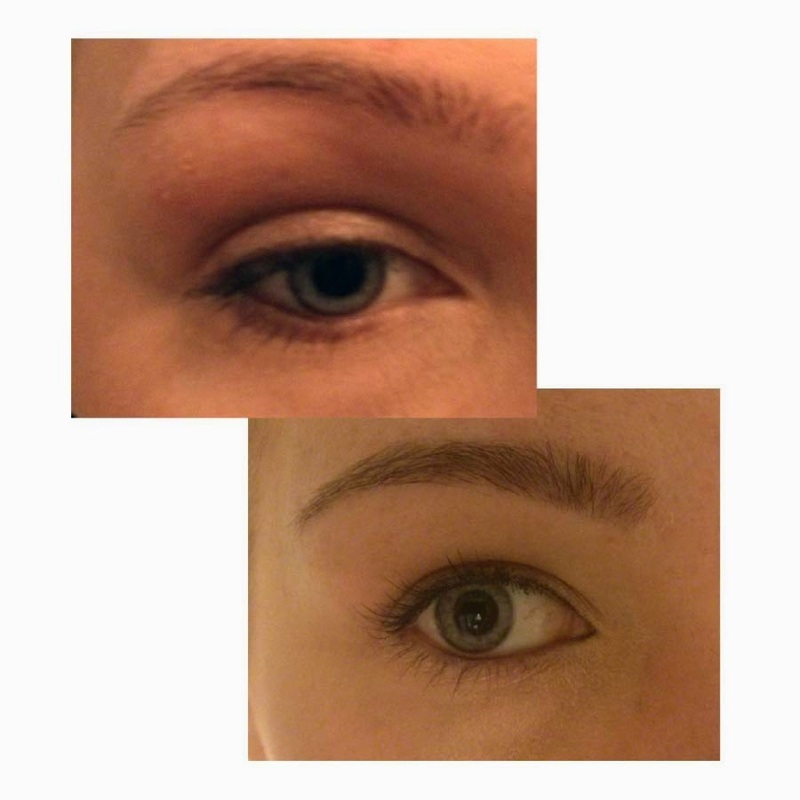 We do have a brow safe lightener that when used before the tint can help stubborn hairs take more easily. Each product is applied for usually 1-10 minutes depending on the desired results. It is then removed with cotton pads and water and you're done! We'll have you double check the colour before leaving, we can always go darker. Lightening a tint is far more difficult. Eyebrow tints can be done at your leisure, you'll usually start noticing slight fading in 5-7 days, especially if swimming in chlorine or getting a lot of sun. Eliss does her eyebrows once a week (usually because she changes her hair colour too often), Nikki is closer to every 5 weeks. 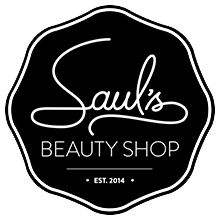 Saul's carries all available tint options, so your colour can be red based/warm, grey or ashy. Most spas only carry dark brown and light brown. We also use a cream developer instead of liquid, this makes seepage (like during an eyelash tint) more difficult. If you have any questions or concerns about our tints feel free to drop us a line! Request an appointment for your tint online by clicking here!